It was a cold and windy day in Sussex so we decided to drive to Hedgecourt instead of walking. We were walking along the path in the direction of the reeds, when I saw an avian form fly swiftly from behind the twisting trees. A raptor gliding effortlessly over the dark menacing water, a contrast to the billowing clouds above. A Buzzard – a crafty hunter, built for ruling the air. The flock of Black-Headed Gulls took to the grey skies as they spotted the Buzzard, aware of every movement from the bird. The Buzzard didn’t seem intent on killing at that time, so it just soared placidly onwards, until it was hidden once again by the tall trees. I only just noticed that I had developed some stalkers, two Canada Geese hung behind while two dominant and quite noticeably large Mute Swans led the small procession. I knew what they wanted. Bread. Though they weren’t in luck. The swans were the former parents of a brood of a grand total of seven cygnets, though now they only had four. 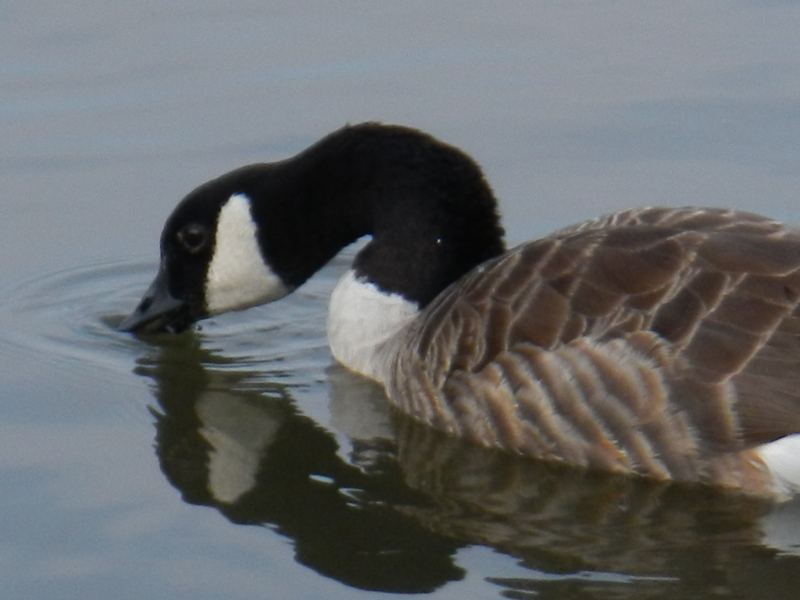 Four was still impressive though, their rivals at the other side of the lake only had one. They were the rightful owners of this part of the lake, they were stronger, healthier and generally better at standing up for their patch. Their part of the lake was the largest, the other end of the lake was split into two parts, one for the two parents of a lonely single cygnet and the other for a bachelor cob without a mate or family. 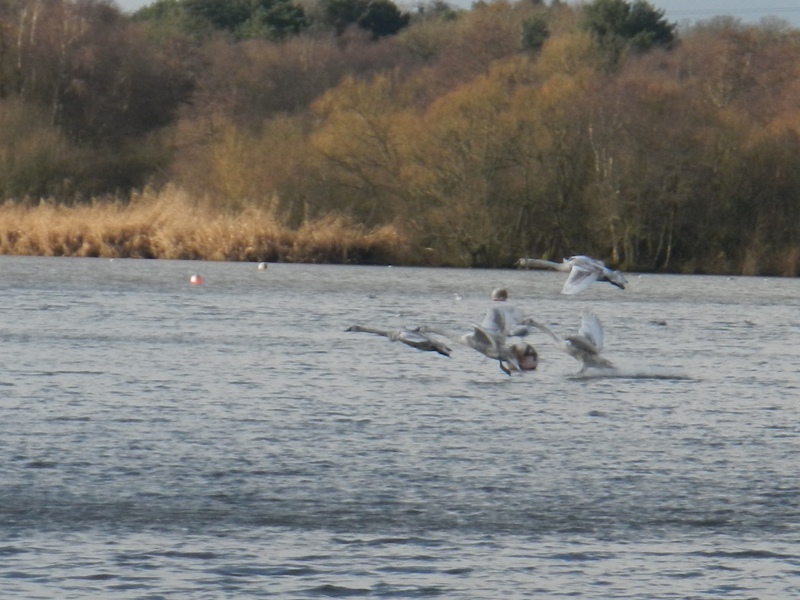 It was then I noticed that the 2 parents of the single cygnet had started to swim towards this end of the lake. I had heard that they often fight, so I was braced for the action. I looked back down to the resident two swans (which were only a few feet away) and I noticed that the cob had peeled off in the direction of the intruders. 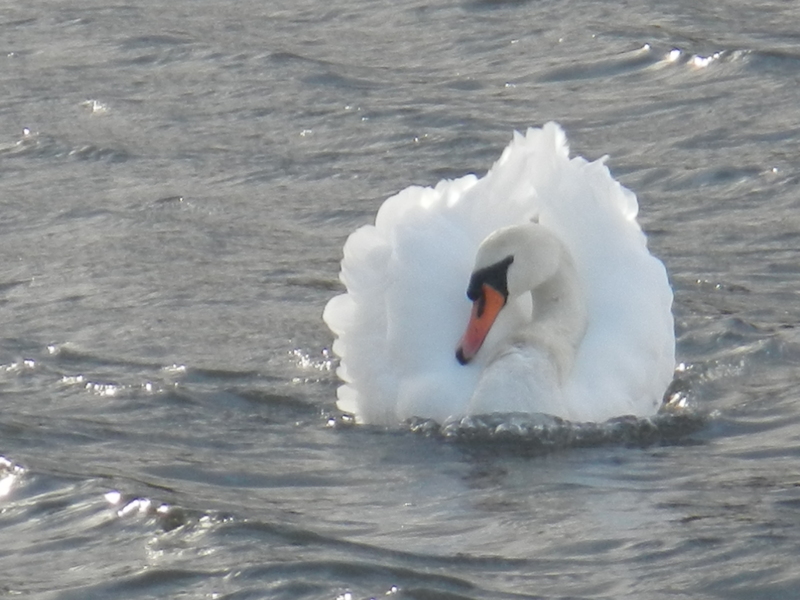 He looked like he was going to face the two swans on his own even though he was outnumbered. He had probably done it before so I was sure that he was going to win, although I couldn’t be certain. They were getting closer and closer, though the female intruder had split from the male so it was cob on cob. 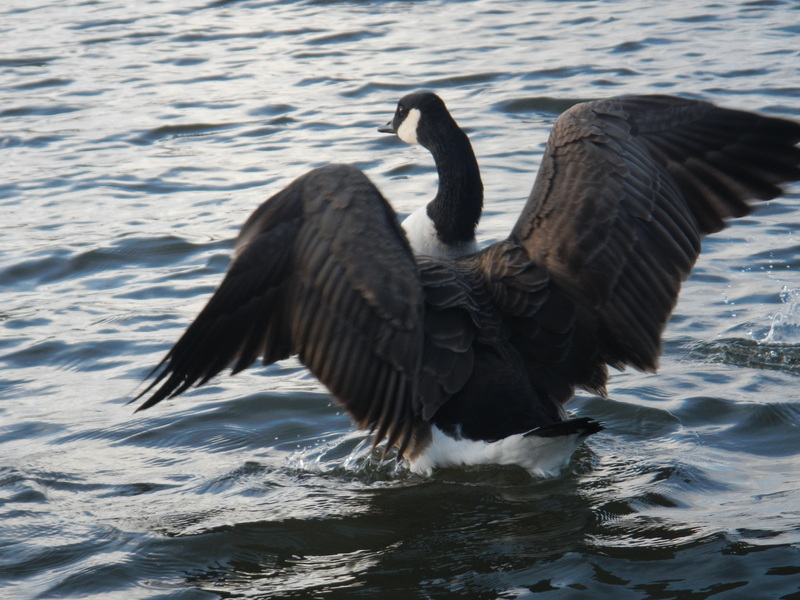 Suddenly it happened, the resident male, took off and flew with strong wingbeats in the direction of the attacker. The intruder then started flying too, and there was a frenzy of water as two of the largest flying birds fought in the air. The commotion made the resident’s four cygnets take flight and one of my following Canada geese to fly away as well. 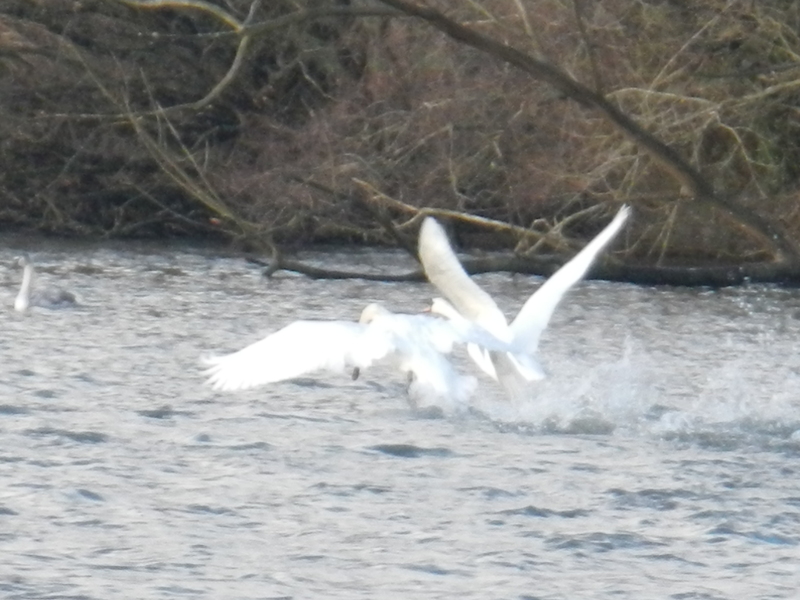 The resident mute swan then appeared to land on top of the intruder, causing lots of thrashing, until the intruder speedily retreated. 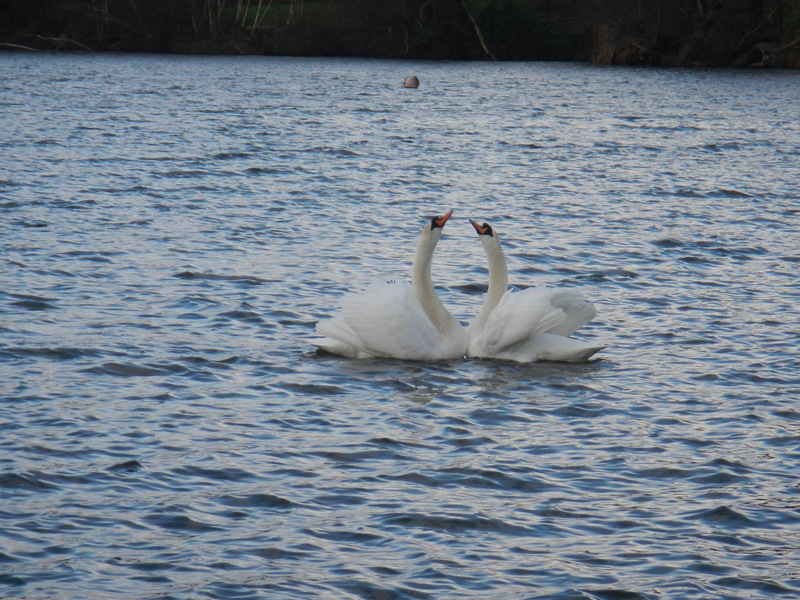 The dominant pair then slowly met up and performed a victory ritual on the serene waters of Hedgecourt. Finally, I saw a Pochard on the lake behind the Private Waters sign, the first I’ve seen on this lake. It then flew off.